Day 1 results from Budapest. Ekaterinburg Grand Slam winner ENDO Hiromi (JPN) won her third IJF title in Budapest as she repeated her 2016 Grand Prix victory in the city where she also won the Cadet Worlds in 2009. ENDO is Japan’s number three at -48kg with world champion TONAKI Funa and Olympic bronze medallist KONDO Ami (JPN) ahead of her but now has two gold medals on the IJF World Judo Tour in 2018. ENDO defeated Portugal European Open winner YAMAZAKI Tamami (JPN) in the final by a waza-ari score from a morote-seoi-nage. In the first semi-final ENDO dispatched European Championships silver medallist Distria KRASNIQI (KOS) after five minutes of golden score with a booming morote-seoi-nage for ippon. 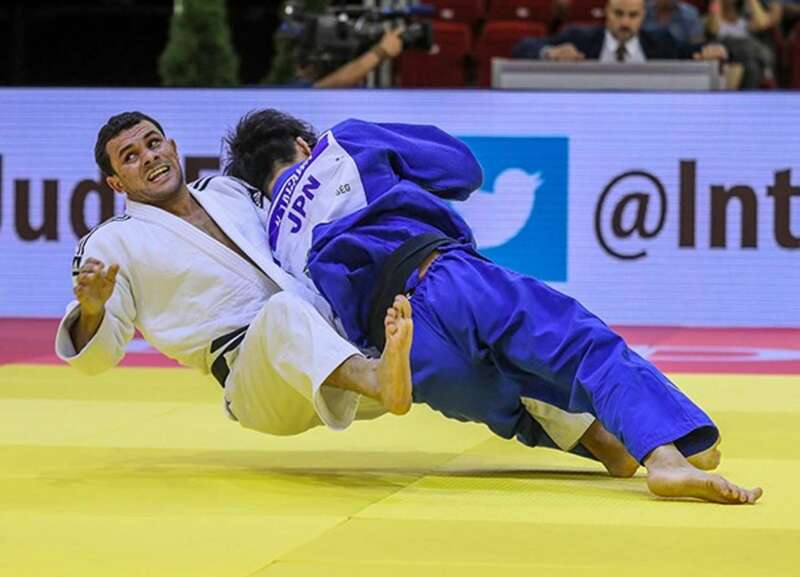 In the second semi-final Tbilisi Grand Prix gold medallist Marusa STANGAR (SLO) lost out to YAMAZAKI by ippon. The first bronze medal contest was won by world number 16 STANGAR who beat top seed Milica NIKOLIC (SRB). Slovenia’s STANGAR fought back from being a waza-ari behind to level the score and threw with an ouchi-gari for a second and match-winning score. The second bronze medal was won by KRASNIQI who saw off world number 24 Anne Sophie JURA (BEL). JURA will have to return another day to make a breakthrough on the IJF World Judo Tour while Kosovo’s KRASNIQI is going from strength to strength at -48kg and finally looks settled at the lighest category. -52kg: World medallist TSUNODA wins gold on first Grand Prix outing Former Tokyo Grand Slam winner TSUNODA Natsumi (JPN) won on her Grand Prix debut to keep the pressure on her -52kg rivals in Japan. 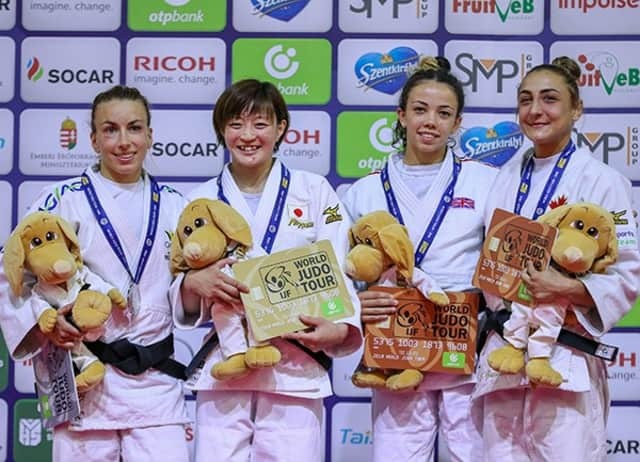 TSUNODA, who lost to teammate SHISHIME Ai in the Worlds final in Budapest a year ago, left as a winner this time after winning all five of her contests by ippon. The Japanese judoka defeated Zagreb Grand Prix bronze medallist Charline VAN SNICK (BEL) in the final with a ko-uchi-gari in golden score. In the first semi-final VAN SNICK defeated former Baku Grand Slam winner Gili COHEN (ISR) by ippon. In the second semi-final TSUNODA surpassed three-time world medallist Andreea CHITU (ROU) who was disqualified after receiving three penalties. 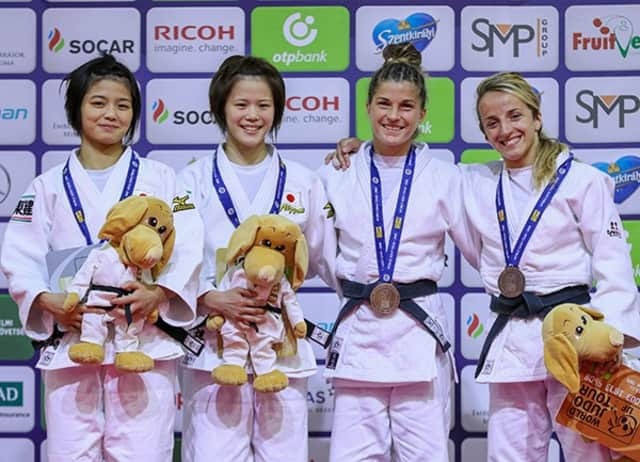 The first bronze medal was awarded to Antalya Grand Prix silver medallist Chelsie GILES (GBR) who threw for waza-ari and followed up with a juji-gatame to submit CHITU. British youngster GILES showed her maturity by defeating one of the most decorated current judoka in the category with a polished display. The second bronze medal was won by Pan American Championships bronze medallist Ecaterina GUICA (CAN) who submitted COHEN with a juji-gatame as the Israeli was caught off guard by the Canadian. Olympic champion Rafaela SILVA (BRA) made an overdue appearance on the top of the podium on day one as the Brazilian hero defeated European silver medallist Theresa STOLL (GER) in the final. SILVA last won gold at Rio 2016 and her last IJF gold medal was also back in 2016 (Tbilisi Grand Prix) but rediscovered her best form today. 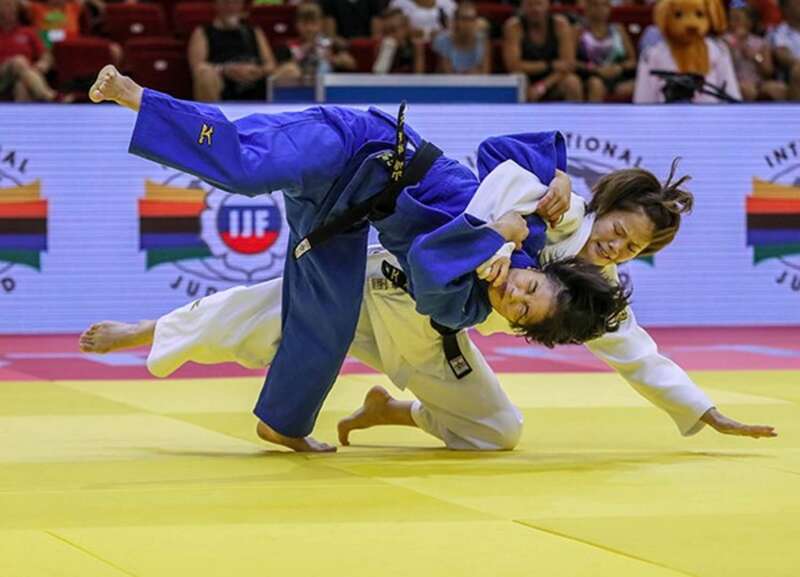 The 2013 world champion went ahead by rolling STOLL over for a waza-ari and the German replied with a waza-ari of her own with the same technique. SILVA had the final say as she rolled her opponent over once more for a second and match-winning waza-ari in the closing seconds. In the first semi-final STOLL utilised her ashi-waza to defeat former world champion UDAKA Nae (JPN) by ippon in golden score. In the second semi-final Zagreb Grand Prix bronze medallist KARAKAS Hedvig (HUN) fell to SILVA by a waza-ari which was the only score of the contest. 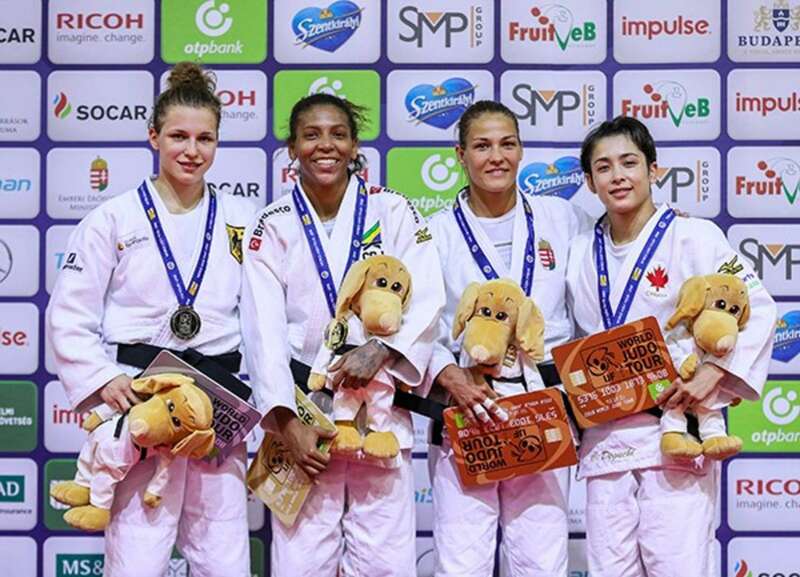 The first bronze medal was won by KARAKAS who tapped out Zagreb Grand Prix bronze medallist Jessica KLIMKAIT (CAN) with a trademark juji-gatame. Ne-waza ace KARAKAS won the first medal for the hosts and matched her result from Croatia to continue her strong start to her Tokyo 2020 qualification campaign. The second bronze medal was won by Paris Grand Slam gold medallist Christa DEGUCHI (CAN) over former teammate UDAKA. 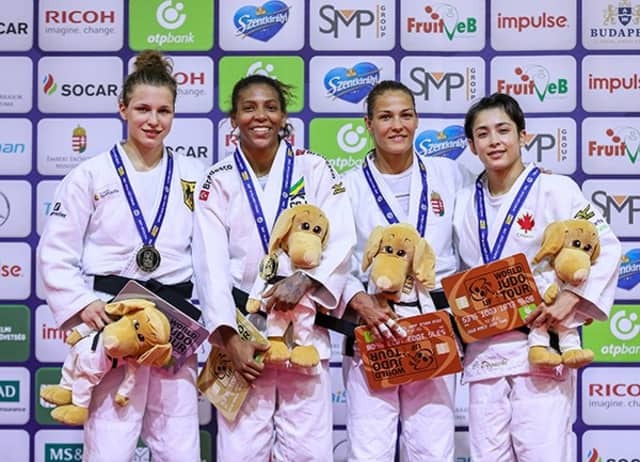 Olympic champion Rafaela SILVA (BRA) ended the Canadian’s 26-fight winning-streak in the quarter-final but bounced back to win her third medal from the three Tokyo 2020 qualification events to date. UDAKA was caught with an ouchi-gari for ippon and may now miss out on international call-ups in the future. 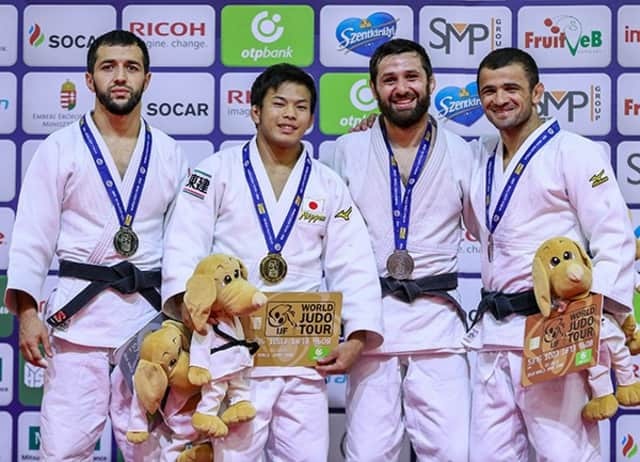 Düsseldorf Grand Slam gold medallist NAGAYAMA Ryuju (JPN) put on a masterclass in the -60kg category as he won gold at his first Grand Prix event. Former world number one NAGAYAMA, 22, powered to the summit of the category with three Grand Slam gold medals but has recently been replaced by world champion TAKATO Naohisa (JPN) who is now world number one. NAGAYAMA went unbeaten in Budapest as he won all five of his contests to contribute to Japan’s sensational opening day. The Tokai University member threw Hohhot Grand Prix bronze medallist Albert OGUZOV (RUS) for a waza-ari score with an ippon seoi-nage and moved straight into osaekomi-waza from which the Russian immediately tapped out. 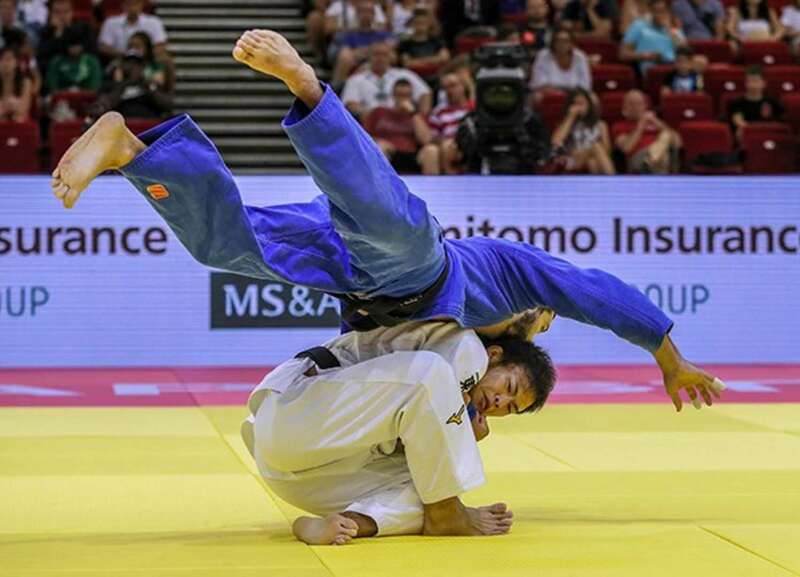 In the first semi-final NAGAYAMA defeated Cancun Grand Prix winner Francisco GARRIGOS (ESP) as he come from behind and escaped a hold down to win by ippon. 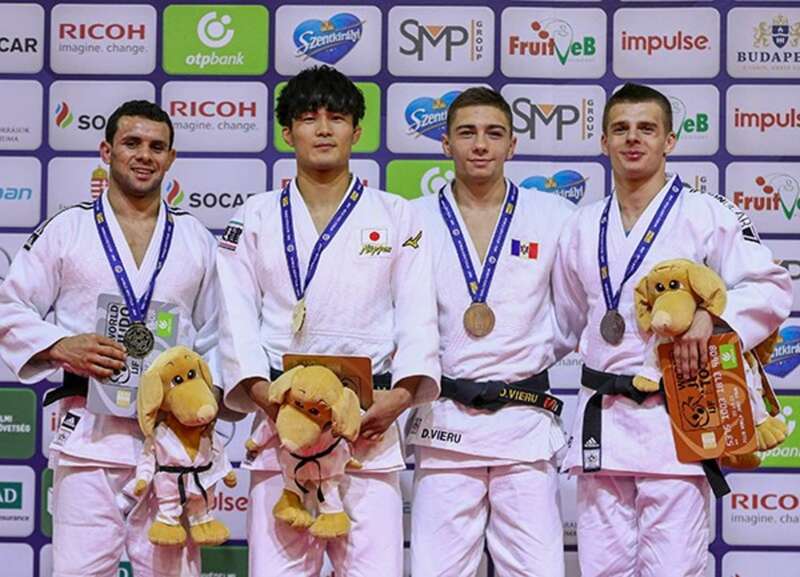 In the second semi-final Düsseldorf Grand Slam runner-up Robert MSHVIDOBADZE (RUS) lost to compatriot OGUZOV by ippon. The first bronze medal was won by MSHVIDOBADZE after Tbilisi Grand Prix winner Lukhumi CHKHVIMIANI (GEO) picked up his third shido in golden score. There was nothing to separate them in regulation time and golden score also failed to produce a score but MSHVIDOBADZE will not be concerned by the manner of the win having earned a vital medal. The second bronze medal went to Tbilisi Grand Prix silver medallist Amiran PAPINASHVILI (GEO) who threw GARRIGOS for ippon. PAPINASHVILI countered the young Spaniard for the maximum score to win his country’s first medal at the Budapest Grand Prix 2018. Düsseldorf Grand Slam winner TAGAWA Kenzo (JPN) prevailed at -66kg as he negotiated a talent-rich field which was also the biggest in the competition. From the 61 judoka who started out this morning, TAGAWA Kenzo was the last man onto the -66kg podium as the gold medallist recorded his second IJF win. The Japanese beat surprise finalist and African Championships winner Mohamed ABDELMAWGOUD (EGY) in the final with a ko-uchi-gake for ippon. In the first semi-final ABDELMAWGOUD defeated Yarin MENAGED (ISR) by ippon to guarantee his first IJF World Judo Tour medal. In the second semi-final TAGAWA conquered world number 18 DOVDON Altansukh (MGL) who was disqualified after receiving three penalties. The first bronze medal was won by Antalya Grand Prix silver medallist Denis VIERU (MDA) who threw DOVDON with an osoto-gari for ippon. VIERU charged forward and drove his Mongolian opponent down for the maximum score to win his second medal on the IJF World Judo Tour. The second bronze medal went to world number 72 Bogdan IADOV (UKR) who beat MENAGED by ippon in a battle between two judoka who had never earned IJF silverware.